Marketo was focusing efforts and spend on driving leads. Therefore, a large amount of spend was being attributed to the campaigns that drove the highest number of leads but we were unable to determine if those leads were actually turning into real opportunities. Obility, at the end of Q2 2016, started tracking Pipeline and Opportunities back to the campaign level for each platform. Marketo and Obility quickly started to notice that campaigns that were driving a high number of leads weren’t necessarily driving opportunities. Then in early 2017, as spend began to be reined in on all platforms, Marketo and Obility decided to take a lead quality approach to driving ROI. Overall, spend decreased drastically YoY but Pipe: Cost increased on all channels (see chart). LinkedIn spend had a 40% decrease YoY in spend and saw a 27% decrease in leads YoY. However, Pipeline doubled YoY and Pipe:Cost increased by 224%. Facebook spend was decreased by 66% YoY, and saw a 56% decrease in leads. However, the quality of Opportunities improved and we saw an increase in Pipe:Cost ratio of 168% YoY. AdWords exhibited a 59% decrease in spend YoY, which resulted in a 37% drop in leads & 44% drop in Opportunity volume. 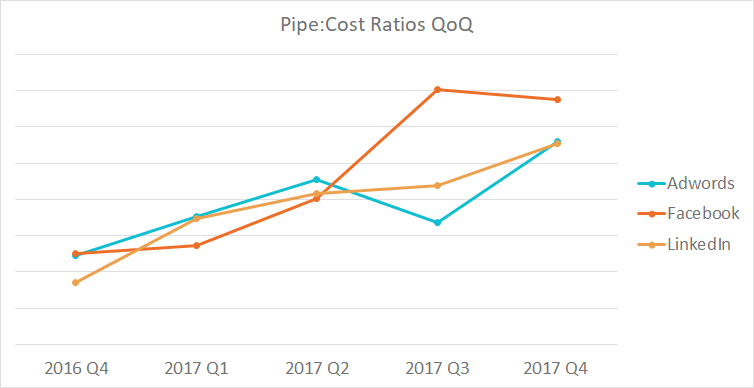 While volume decreased, quality saw strong improvement as the Pipe: Cost ratio more than doubled and average Opportunity size increased 69% YoY. Marketo, Inc., offers the leading Engagement Platform™ that empowers marketers to create lasting relationships and grow revenue. Consistently recognized as the industry’s innovation pioneer, Marketo is the trusted platform for thousands of CMOs thanks to its scalability, reliability, and openness. Marketo is headquartered in San Mateo, CA, with offices around the world, and serves as a strategic partner to large enterprise and fast-growing organizations across a wide variety of industries. To learn more about the Marketo Engagement Platform, LaunchPoint® partner ecosystem, and the vast community that is the Marketing Nation®, visit their site. We have one purpose: help B2B companies generate demand and increase revenue through online marketing. Located in Portland, Oregon and founded in early 2011, we’re a fast-growing agency with a global client base ranging from early stage start-ups to multinational enterprises. Our focus is on B2B companies and we’re proud that our growth has been due primarily to client referrals.